Canfield of Dreams | If we come, they'd better build it . . .
We’re settling, sort of, in Arizona. San Tan Valley to be precise. In March of 2016 my oldest daughter and son-in-law moved from California to Tucson. After much family discussion we decided it was best to move closer to them so Fiona could be nearer her best friend – her big sister! Especially during her teen years. So in June 2016 we left Wisconsin to move to Arizona. It wasn’t easy. Fiona even had to think twice about leaving the beautiful snowy winters in Wisconsin to live in hot, dry Arizona. We all loved the snow, winter, the seasons in Wisconsin! Arizona though did have her big sister, Joel’s good friend Terry, my aunt, uncle, and cousin. The drier weather would probably be good for my rheumatoid arthritis. So we made plans and moved. After staying with our good friends, Terry & Virgie, for a couple of months, we found the place we’re now living in. We do like the house and where it’s located – far away from the bustle of the big city of Phoenix. Close enough to take Fiona to visit her big sister monthly instead of only once a year. We’ve made some really, really good friends. We did go back to Wisconsin last August to get some relief from the heat – and visited all our friends there that we missed as well as Joel’s mom and my son James. We plan to do that again this year. 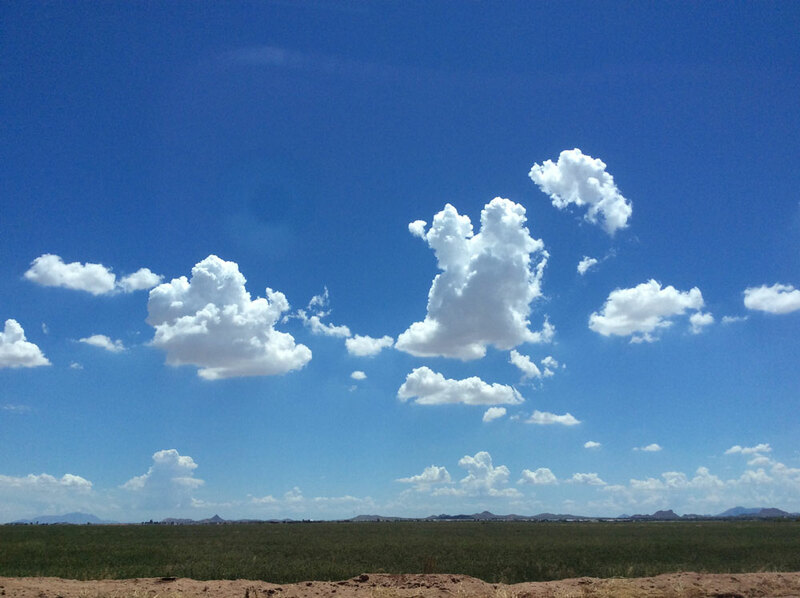 Arizona does have its own beauty – like these beautiful days when the sky is so blue and the clouds puffy white. For now, we’re settling here. So far, so good. I’ve made these several times for people and always get great compliments! Mix 2 C flour and confectioners sugar together. Cut in Crisco. Mix well. Press into baking pan. Beat together eggs, sugar, 4 TB flour, lemon juice and zest for 1 minute. Pour over baked crust. Bake 20 minutes or until set. When cool, sprinkle w/confectioners sugar. Yesterday we had a two-for-one experience. Since our good friend Rod lives about an hour from the friends we are staying with in Phoenix and Joel’s Uncle Bill and his wife live about an hour in the opposite direction, they all met us partway at an Applebee’s to visit. So we were able to visit with Rod who we hadn’t seen in 10 years and Sue was able to meet Joel’s Uncle Bill who he hadn’t seen in over 40 years! It was great to visit with everyone at once and even find out that Rod and Bill had mutual friends. We really hope we can come back sooner than later and visit with them all again. Today is our last day in Phoenix and we’ll be seeing Sue’s Uncle Phil and family and then staying the last night with author Alex Zabala and his wife again before heading Monday morning for San Diego.